This article is about the fictional Skull Island of King Kong. For other uses, see Skull Island (disambiguation). The Map of Skull Island as seen in the 1933 King Kong film. Skull Island is the name most often used to describe a fictional island that first appeared in the 1933 film King Kong and later appearing in its sequels, the two remakes, and any other King Kong-based media. It is the home of the eponymous King Kong and several other species of creatures, mostly prehistoric and in some cases species that should have been extinct long before the rise of mammalian creatures, along with a primitive society of humans. In the 1962 film King Kong vs. Godzilla and the 1967 film King Kong Escapes, the comparable islands are called "Farou Island" and "Mondo Island", respectively. Kong plays a similar role in these islands as the god-like being of the land, a role he plays in all versions of the King Kong story. Skull Island's origins are unknown, but Kong appears to be the only giant gorilla known to exist on the island. However, the 2005 remake shows other skeletons of Kong-sized gorillas, indicating that there was once a group of such creatures of an unknown number living on the island. Additionally, 2017's Kong: Skull Island depicts the skeletons of Kong's parents. In King Kong, the island is never mentioned by name and is located at approximately 12°S 78°E﻿ / ﻿12°S 78°E﻿ / -12; 78 – somewhere off the coast of Sumatra, Indonesia. There is a distinctive rocky knoll in the center of the island that is shaped like a human skull, which is referred to as "Skull Mountain". At first, the island is thought to be deserted, but upon further examination by the protagonists of the picture, it is filled to the brim with superstitious natives, prehistoric creatures of all sorts, and one extremely large gorilla, known by those on the island as "Kong". The ancestry of the natives is never really explained, although the setting suggests they are a Southeast Asian group. In the sequel film Son of Kong, Carl Denham returns to Skull Island when there was mentioning of some treasure that was hidden there. He also encounters a large white gorilla who is the son of King Kong. Skull Island sinks into the sea during a powerful earthquake. Kong's son drowns while holding Carl Denham above the water. Denham survives unscathed while the treasure is claimed by him and the other three survivors. The term "Skull Island" is never used in the original films. In King Kong, only "Skull Mountain" is named, while in the sequel Son of Kong, its simply referred to as "Kong's Island". In the novelization of King Kong by Delos Lovelace, it is called "Skull Mountain Island". But RKO referred to it as "Skull Island" in some of their publicity materials. In the 1976's King Kong, Skull Island is mentioned as being "the beach of the skull." It is located somewhere in Indian Ocean, covered by a permanent cloud bank. Various people are said to have visited the island through the centuries but returned with no clear proof. By the 1970s, it is an urban legend whose only evidence is in government secret files. It is also revealed to have a huge deposit of oil, which led a greedy oil company executive to go in search of it. Besides featuring a primitive native tribe (most seem to be of West African ancestry) and the giant, bipedal gorilla Kong, there is also a giant snake who appeared in Kong's lair and wanted to kill him and Dwan, but it was killed by the former. In 1986 sequel film King Kong Lives, Skull Island does not appear but it was mentioned by adventurer Hank Mitchell (mistakenly calling it Kong Island) who believed that the islands Borneo and Skull Island were once a part of the same landmass in the past. The fate of this incarnation is unknown. A 2004 illustrated novel that serves as both prequel and sequel of the original "King Kong" story, conceived by Merian C. Cooper and novelized by Delos Lovelace in 1932, and authorized by the Cooper family. Created and Illustrated by Joe DeVito [and novelized by Brad Strickland and DeVito, with John Michlig] Kong: King of Skull Island depicts a Skull Island far larger than originally thought. It is either the last vestige of a volatile volcanic series of islands or the remnant of a larger land-mass. Skull Island is located in the Indian Ocean, west of Sumatra, and has several much smaller islands in various locations around its perimeter, with the most prevalent of these off a small peninsula on its southeast corner. Skull Island contains two main mountains, the larger being shaped in the visage of a human skull. Skull Mountain is riddled with subterranean caves and passageways carved out by natural erosion, but also man-made. In earlier times, these were often used by islanders to avoid the monsters on the surface but proved to have a multitude of dangerous denizens of their own. These include previously unknown species such as snake-like amphibians with enormous heads capable of swallowing a human whole; foot-long creatures that combine squid and crustacean characteristics with bio-luminescent sails tipped with poisonous stingers; giant spiders with 7-foot bodies and 8-foot-long legs ending in hand-like appendages. The human civilization that inhabits Skull Island at least through the Twentieth Century is the last remnant of a previously unknown super-race called the Tagatu (a combination of two formerly separate tribes: the Tagu and the Atu). The original culture is believed to have Asian origins that bled into an island group west of Sumatra that no longer exists. As a result of a natural disaster, they were forced to migrate to Skull Island untold millennia ago. Drawn to its spectacular makeup by their insatiable curiosity, the Tagatu believed their mastery of biological and organic sciences could overcome Skull Island's dangers. It was they who originally brought the gigantic simian Kongs there for protection and who, with the help of the Kongs, built the iconic wall across the Skull Island’s peninsula for protections against Skull Island’s prehistoric denizens. Among the many mysteries revealed in the work is the reality that on Skull Island the dinosaurs never died out, but continued to evolve over the intervening 65 million years. This has resulted in strange variations on previously known species, as well as many new ones. Chief among the latter is a race of sentient dinosaurs, called Deathrunners. Bipedal, extremely aggressive and 6 to 9 feet tall, they once ruled the island and were at war with the Tagatu and the Kongs. Their race is propagated every few generations by one queen that grows to gigantic size. It is one of these, called “Gaw”, that ruled Skull Island when King Kong was born and who Kong had to defeat in order to become a king. In the story, Carl Denham's son, Vincent (now a paleontologist), and an older Jack Driscoll return to Skull Island in 1957 to discover pieces of the earlier civilization’s history and relationship to the island through an enigmatic Tagatu elder simply called, “Storyteller”, as well as in the form of archaeological discoveries such as specially pigmented paintings in underground passageways that move when illuminated by torchlight to reveal past events on Skull Island. Primary among these is the discovery of remnants of “The Old City”, which was established by the Tagatu at the zenith of their civilization in the center of the island in an ideal valley between the two mountains. The Storyteller's tale, along with Vincent and Driscoll's findings, suggest that the eerie skull visage that gave the island its name may have been the work of human hands. These and other discoveries hint that the true extent of Skull Island’s secrets have yet to be revealed. In Peter Jackson's remake, Skull Island's position west of Sumatra remains the same, in a region afflicted by magnetic anomalies and violent sea storms. According to the book The World of Kong: A Natural History of Skull Island, Skull Island was geologically unstable and has been slowly sinking into the sea for the past thousand years. By 1933, the island was on the verge of destruction. Fifteen years after its discovery to the modern world, Skull Island finally sank into the ocean. In its prehistory, Skull Island was a refuge for a variety of prehistoric creatures. Over time, more and more species arrived either by swimming, flying, rafting, or migrating through temporary land bridges. As the island slowly receded into the sea, life was forced to adapt, resulting in an ecosystem of bizarre and nightmarish creatures. Three thousand years before, an advanced civilization from Southeast Asia migrated to Skull Island, bringing with them domesticated animals such as Gaur and the giant ancestors of Kong. This culture eventually died off, leaving behind only gigantic eroding ruins scattered around the island (such as the enormous wall) and a small society of primitive people that became the Skull Island natives. Across close to 400 pages Doc Savage: Skull Island takes us not only on a journey to Skull Island, but to the beginnings of a young man’s rise to greatness. Mr. Murray has created a new classic of the genre – all the while staying completely true to the legends of both Kong and Doc Savage. Altus Press has announced an authorized crossover novel, King Kong Vs. Tarzan, for release in the summer of 2016. Written by Will Murray, it tells the previously untold story of the transportation by cargo ship of Kong from Skull Island to America, and King Kong's inevitable encounter with Tarzan of the Apes. Skull Island is the main setting of Kong: Skull Island, which is set in the same universe of Gareth Edwards' 2014 film Godzilla. Kong is 104 feet (31.7 m) tall in the film and there is evidence that Kong's species once existed on the island. The island is located in the South Pacific and sits in the eye of a massive swirling storm system that has enabled its concealment from the outside world. One of the other main species seen on the island are large, two-legged, mostly subterranean lizard-like creatures that have come to be known as "Skullcrawlers" that are referred to as the island's "devils". The Skullcrawlers wiped out King Kong's family, making him the last of his kind. 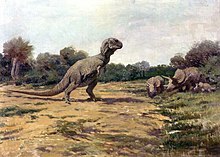 There is also evidence of dinosaurs living, or having lived, on the island, in the form of a Triceratops skull found in the "graveyard" of the island. A number of other species are referred to as "florafauna" for displaying physiological traits of plants. Similar to previous incarnations, there is a human native tribe present (characterized as Iwis) who are much less hostile than in previous versions, mainly because a stranded air pilot from World War II named Hank Marlow makes peace between them and modern-day humans. The film sees an expedition in 1973 landing upon the island after Skull Island is detected by Landsat. Stegosaurus – Appears in a sequence in which it is disturbed by Carl Denham's crew. It charges the men and they fell it with a gas-bomb. As they walk by, it starts to get up again and is shot. Orville Goldner, who worked on the film, described the film's Stegosaur as a combination of two genera: Stegosaurus and the less well-known Kentrosaurus. Another appeared in a deleted scene when Denham ran back to the village, after Kong’s battle with the T-Rex. Brontosaurus – The dinosaur is disturbed by the rescue party's raft as it crosses a swamp and capsizes it, attacking the men in the water. Several of them are chased onto land, and one fellow is cornered while climbing a tree and maimed to death by the animal. A common misconception is that the sauropod actually eats the sailor, but it is stated in the script and observed in the film that the dinosaur kills and then abandons the body of a sailor identified as "Tim." The creature reappears in Son of Kong, crying out as the island is sinking. A large 2-legged lizard – This reptilian creature climbs up a vine from the crevasse to attack Jack Driscoll. It falls back into the pit when Jack cuts the vine it is climbing. Other than the two limbs, the other distinct feature of this creature is the iguana-like ridge of spikes down its back. Orville Goldner said it was loosely based on the features of the Desmatosuchus. Tyrannosaurus – The dinosaur was modeled after Charles R. Knight's depiction of a Tyrannosaurus. However, it possesses three fingers per hand, unlike Tyrannosaurus which had only two (however, the number of fingers in Tyrannosaurus was disputed at the time, as a complete manus was not discovered until the mid-1990s). In the documentary I'm King Kong! The Exploits of Merian C. Cooper, included on the 2 disk DVD release of King Kong, Cooper refers to this beast as an Allosaurus, not a Tyrannosaurus, which would help explain the number of fingers. However, the creature was originally intended to be a Tyrannosaurus designed for the cancelled Willis O'Brien film Creation (1931). It may also be worth noting that the Tyrannosaurus present in Willis O'Brien's earlier project The Lost World (1925) also had a third finger. The 1932 King Kong screenplay refers to the dinosaur only as a "Meat Eater." The creature appears in the iconic scene where Kong defends Anne from its attack, killing it after a protracted fight. An Elasmosaurus-like creature – A highly stylized, serpentine aquatic reptile with a long neck and tail as well as two pairs of flippers. It inhabits the bubbling swamp area inside King Kong's cave. Goldner describes the Elasmosaurus as "being designed as more slender than the ones known to science, and its swimming limbs are less prominent. In those respects, it more closely resembles the polydactyl nothosaur Ceresiosaurus." It also resembles the long-necked reptile Tanystropheus. It battles Kong in the style of a giant, constricting snake. Giant Pteranodon – It menaces Anne and is the last major creature to appear on Skull Island. It is slain by King Kong. Teratornis – These birds can be seen flying around the dead Tyrannosaurus. One is seen eating the dead Tyrannosaurus and is frightened off by the approaching Jack Driscoll. Rhamphorhynchus – The tiny Rhamphorhynchus are seen flying around Skull Mountain. A few are flying around the large cave at the base of Skull Mountain, while others are seen at Kong's lair near the top of Skull Mountain. Archaeopteryx – The tiny Archaeopteryx are seen flying around in the jungle. Most notably a few fly by when the Stegosaurus enters the clearing, and one flies out of the dead tree that Kong puts Ann in before he goes to fight the sailors on the log bridge. According to Goldner, they "were made to flit among the trees on invisible wires." Arsinoitherium – This huge prehistoric mammal was to chase the men onto the log bridge and corner them between itself and the enraged Kong. in the test reel. According to Goldner, Cooper had second thoughts about the Arsinotherium and "ordered the action to be re-filmed using a Styracosaurus. Both versions were eventually thrown out because they captured too much audience attention." This can be attested to by the fact that the sailors did not just run back across the log when Kong appeared. Gigantophis garstini – According to Goldner, "This huge snake that appeared in one scene and later cut out of the film, had its living prototype in Egypt." This giant snake frightens Ann at the base of the dead tree that Kong puts her in before he battles the sailors on the log bridge. It was in the test reel, but later cut. However, Ann Darrow's reaction to it being below her just before the Tyrannosaurus shows up in the clearing remains in the film. Erythrosuchus – It was created and then re-created for the "spider-pit sequence" and portrayed as a stout reptilian predator. Goldner stated that it was loosely adapted, as many of the creatures of the pit were imaginative. A giant crab, giant spider, and giant tentacled "bug" – They all appear in the original notes, script, and re-created "spider-pit sequence," eating the surviving crewmen in the crevasse. Triceratops – In the original script only, it was encountered by Kong on volcanic flats. He hurls boulders at a herd of them and drives them into a stampede, impaling one of the crew of the Venture. It was also seen in a deleted scene in Son of Kong. Giant Cave Bear – A gigantic cave bear that attacks Denham and Hilda, but is driven off by the Son of Kong. Styracosaurus – A Styracosaurus corners Hellstrom, Englehorn and Charlie into a cave in Son of Kong, destroying one of their guns. Originally slated to appear in King Kong, chasing the crew onto the log bridge and keeping them trapped there. Nothosaurus – A dragon-like creature that threatens Denham and Hilda, but is fended off and killed by the Son of Kong. King Kong: A History of a Movie Icon calls the creature 'The Dragon' all through its review of Son of Kong. In some respects, it resembles a very large Protorosaurus. Elasmosaurus – A very stylized incarnation of this marine reptile eats Hellstrom as he attempts to flee at the end of Son of Kong. The 'snapping' version that grabbed Hellstrom was actually the revamped Brontosaurus from the original film; the same holds for the armature version seen briefly snarling in predatory glee. Armadillo – A small armored mammal that was seen in the pilot episode where it was attacked and carried away by a Pteranodon. Pteranodon – A flying reptile that was seen in the pilot episode where it attacked and carried away an armadillo. Stegosaurus – A Stegosaurus was seen in the pilot episode where Bobby encountered it eating a bush. Tyrannosaurus – A Tyrannosaurus was seen in the pilot episode (also in the title sequence) where it attacked Bobby when he got lost, but was defeated by Kong when he came to Bobby's aid. Just like the Tyrannosaurus in the original film, it has three fingers instead of two fingers. Triceratops - A Triceratops appears in two episodes, both where it fights Kong. It is described as "the most vicious animal in the world". Aside from Kong and the island natives, the only other creature that appears in the 1976 film is a giant snake. Pteranodon – Lua's friend Soara is a Pteranodon. Smilodon – Lua's friend Chon-Darr is a Smilodon. Woolly Mammoth – In one episode, Kong saved a baby woolly mammoth from flowing lava. All the creatures in Peter Jackson's remake of King Kong do not appear to be any real species of animal, but do resemble certain ones. The companion book The World of Kong: A Natural History of Skull Island, elaborates on this stating that they are fictional descendants of real animals. Brontosaurus baxteri – A large Brontosaurus-like sauropod which (despite the name) is more similar in size and appearance to Argentinosaurus that appears early in the film. They are attacked by a pack of Venatosaurus and cause a stampede. They trample several of the crew and some of the Venatosaurus. Like real sauropods, they are social animals that organize in herds led by a dominant bull. Unlike all real sauropods, Brontosaurus give birth to between one and three live young rather than reproducing with eggs. As Skull Island's largest herbivore, they are responsible for keeping the jungle from overrunning the remaining grasslands. Brutornis – A phorusrhacid that is seen in the extended cut of King Kong and in The World of Kong. In the extended cut, the crew of the Venture mistake one for Ann and Lumpy shoots it by mistake when he loses his nerves. After being discovered by the crew, the dying terror bird is then killed by Lumpy. Ferrucutus cerastes – A giant ceratopsian that bears slight resemblance to Pachyrhinosaurus. It appears only in the extended cut and in a cameo as Kong climbs to his lair. In the extended cut, a large male attacks the crew and almost kills Jack Driscoll before being killed by Hayes. Ferrucutus is an aggressive herbivore that dwells in small family groups. Like their ancestors, Ferrucutus bulls spar violently even to the point of killing their rivals. Foetodon ferrus – A terrestrial crocodilian about 20 feet (6.1 metres) long that appears in both the film and the companion book. In the film, Ann stumbles across a mated pair of Foetodon feeding on a dead Ligocristus. The predators pursue her into a hollow log, and a sub-adult V. rex appears by killing and eating one of the pursuing Foetodon, forcing its mate to flee. Foetodon is an ambush predator that hides in deep piles of leaves, waiting for small dinosaurs and large flightless birds to wander past. Arachnocidis – A giant arachnid. Carnictis – A fluke-like creature that can grow to be several feet long. Several of them eat Lumpy, who manages to slay a few of them. They resemble Ottoia. Decarnocimex – A giant carnivorous cricket. Deinacrida rex – A giant species of weta. Deplector – A giant cave-dwelling crustacean. Ligocristus – A hadrosaur that was being fed upon by a Foetodon. Moonspider - Not a true spider (it is really a member of the Solifugae), the Moonspider is a nocturnal creature that lives in the Lowlands. It appeared briefly in the film when Ann Darrow made her escape from King Kong. They also appear in the associated video game with a much bigger role: they are the only creatures the player cannot kill whatsoever, but they can be lured away with a bait-animal (or a killed predatory one like a Venatosaurus) or repelled with a spear/bone on fire. Piranhadon titanus – Only appearing in The World of Kong and more prominently in the extended cut, Piranhadon is a 50-foot (15.2-metre) fish resembling a plesiosaur. In the extended cut, a Piranhadon attacked the rescue team led by Hayes, Carl Denham and Jack Driscoll, killing three sailors and very nearly swallowing Jack whole. Piranhadon has poor vision, only being able to discern prey's silhouettes, using the barbels on its chin to sense vibrations and the light from the surface to detect passing prey. Terapusmordax obscenus – A giant bat-like rodent. A swarm of them appear in the film roosting in Kong's lair. When Jack Driscoll attempts to save Ann, he awakens Kong. The Terapusmordax then attack Kong; he fends them off while Jack and Ann escape by climbing down a vine. When one of the Terapusmordax attempt to kill Jack and Ann, Jack grabs the wing and the Terapusmordax lowers them down and they fall into the river below. They also appear in the associated video-game where they gain juvenile-forms and a bluish, airplane-sized species. Terapusmordax evolved from hairless rodents that developed wings. They measure about 3–4 feet (0.9–1.2 metres) in body length and 8–10 feet (2.4–3.0 metres) in wingspan. Vastatosaurus Rex – A descendant of Tyrannosaurus, but much bigger with three fingers. It appears in the film in a scene where three of them fight Kong. Vastatosaurus are the top apex predator of Skull Island. They can grow up to 50 feet (15.2 metres) long. Juveniles hunt separately from the adults in the jungle, often coming into conflict with Venatosaurus. They also appear in the associated video game in both incarnations: the adults cannot be killed by humans, only by Kong, and will knock down stone structures to pursue their targets. The juveniles can only be encountered by the player as Jack and unlike their adult-counterparts can be killed by a human. Venatosaurus saevidicus – A slender dromaeosaur which resembles Velociraptor, measuring about 24 feet (7.3 metres) long and surpassing the length of Utahraptor. In the film they ate Carl Denham's cameraman Herb and caused a Brontosaurus stampede. Like real dromaeosaurs, Venatosaurus hunt in packs and they are also the only predators on Skull Island capable of taking down adult Brontosaurus (aside from the V.Rex). They are also highly intelligent and cunning, able to chase prey through ruins and into planned traps. Another smaller Venatosaurus species called Venatosaurus impavidus is also present on the island. Unusually, both species lack feathers, despite being dromaeosaurs. Aciedactylus - A theropod with a long neck and tail. It is stated to have lived in the Coastal Regions. Adlapsusaurus - A Dilophosaurus-like theropod that specializes in raiding other dinosaurs' nests for their eggs. Aliepesaurus - A flying lizard. Ambulaquasaurus - An aquatic version of the dromaeosaurs that lives in the Swamps and Waterways. Arsartis - A four-legged, theropod-descended animal that lives in the Uplands. Asperdorsus - A narrow-bodied sauropod that lives in the Jungles. Aspiscimex - A soft-bodied myriapod from the waterways. Atercurisaurus - A Stegosaurus-like dinosaur that lives in the Jungles. Avarusaurus - An omnivorous dinosaur that lives in the Jungles. Bear-Croc - A thickly-built rauisuchian-like creature that lives in the Uplands. Bidensaurus - A relative to the Lycaesaurus that lives in the Uplands. Bifurcatops - A Ceratopsian that lives in the Uplands. It is a relative of the Tree-Tops. Bile-fin - A fish species. Bloodfish - A fish found in the island's freshwater. They are a common prey item. Brutornis - One of the Terror Birds that lurk in the Lowlands and Jungles. Brutornis is the largest of the bunch. Calcarisaurus - An oversized Thorny devil-like dinosaur that lives in the Lowlands. The only animal that proves to be a threat to the Calcarisaurus is the Venatosaurus. Carrion Centipede - A scavenging centipede species typically found in the lowlands. Carrion Parrot - A type of parrot that feeds off carcasses. It lives in the Lowlands. The Carrion Parrot comes in three types: The Great Carrion Parrot, the Green Carrion Parrot, and the Red Carrion Parrot. Carrion Stork - A bulky, flightless, crested Marabou stork-like bird that lives in the Lowlands. The Carrion Storks are known to feed off carcasses and other small creatures. Carver - A long-tailed, short-necked synapsid with massive shoulders that lives in the Jungles. Celocimex - A dragonfly-like insect. Chaly-Tops - A Ceratopsian that lives in the Uplands. The Chaly-Tops is a relative of the Ferrucutus. Contereobestiolla - A shrimp-like animal. The adults are parasites of fish. Cunaepraedator - A four-armed crab creature native to the island's coastlines. They appear in the associated video game. Cutiscidis - A parasitic crab-creature native to the waterways. Dapper Crow - A type of bird. Dark-wing - A bird that has evolved to fill the niche of woodpeckers. Diablosaurus - A herbivorous dinosaur with horns that lives in the Jungles. Dinocanisaurus - A dog-sized cynodont that lives in the Jungles. It didn't appear in the film. Dirt Turtle - A dung-eating turtle species. Dirusuchus - A coastal crocodilian similar to the Saltwater crocodile. Draco - An orange-brown lizard that lives in the Uplands. Dragonskin - A monitor lizard from the coastal-cliffs. They are one of the more recent island species. Estrivermis - A blood-sucking parasitic worm. Falcatops - A theropod that looks and behaves like a wading bird. Fallow Mantis - An insect resembling a cross between a mantis and a mayfly. Feather Devil - A dinosaur similar in appearance to Microraptor. Firebellied Tree-talon - A cricket-like insect found in the jungle canopies. Fire-side - A fish species. Flizard - The name for all the flying lizards. Aerosaurus - A flying lizard similar in appearance to Sharovipteryx of the Triassic period. Alatusaurus - An Icarosaurus-like genus. There are six species, each with their own colors and diet. Novusaurus - Another flying lizard. They survive solely on butterflies. Flying Rat - A hairless rat with wings that live in the Jungles and Uplands. Flying Rats come in different types. Howler - A Flying Rat with a shaggy coat of hair. Skin-Bird - A Flying Rat that makes its nest on cliffs. Skull Island White Bat - A blind, very bat-like Flying Rat. Terapusmordax - The largest of the Flying Rats. Volucerictis - A small, insectivorous Flying Rat. They are very territorial with each other. Foeducrista - A flightless hornbill-like bird that feeds on carrion. Formicavoro - Also known as the Termito'saurus, Formicavoro is a lizard-shaped synapsid that lives in the Lowlands. Formicavoro is an insectivore. Funucaris - A scavenging freshwater crab. Furcidactylus - A dinosaur resembling the Jacana bird. Gaur - A subspecies of actual gaur. They are the favorite prey of Venatosaurus. Ghoulfish - A Hatchetfish-like fish species. Giant Grey Agama - An agama lizard. Gladiodon - A mammal-like reptile that lives in the Uplands. Great Grey Heron - A descendant of the Grey heron. Gribbler - A fish species. Guard-bug - A mantis-like insect species. Hairy Maggotfly - A scavenging insect known to carry their young on their backs to carcasses. Hamudon - A fish similar to a trout in appearance. Hebeosaurus - A relic aetosaur. They are known to never go down without a fight. Hydruscimex - A "Neopede" that lives in the Swamps and Waterways. It didn't appear in the film. It is similar to the Waterfall centipede of southeast Asia, which was discovered many years later. Hylaeornis - A flightless Terror Bird that lives in the Lowlands. It didn't appear in the film. Idolon - A genus of centipede found in the jungles. Two species are known. Impurucaris - A small crab species similar to swimming crabs in appearance. Incultulepas - A scavenging, aquatic snail related to whelks. Inox - A huge salamander-like creature that lives in the Swamps and Waterways. It didn't appear in the film. Javelin - A gar-like fish. Jewelbug - A type of beetle. Killer Eel - A lamprey-resembling creature that lives in the Swamps and Waterways. They appear in the associated video game, but are only encountered in Kong's lair when one ambushes Ann and Jack, and later fought by the player as Kong, though killing them can be risky and difficult. Ligocristus - A hadrosaur dinosaur with a horn on the back of its head that lives in the Lowlands. A dead one appeared in film, being fed on by a Foetodon. Limusaurus - A shellfish-eating oceanic amphibian. It is not to be confused with the dinosaur also called Limusaurus discovered later. Lividuscutus - A small, herbivorous, lobster-like animal with a strong grip for traversing the wave-battered rocks. Lividuvespa - A wasp-like insect. Lycaesaurus - A dog-shaped gorgonopsian that lives in the Lowlands. Malamagnus - A hippopotamus/lizard-described creature that lives in the Swamps and Waterways. Malevolusaurus - A Dimetrodon-shaped synapsid that lives in the Uplands. Martial Parrot - Another parrot species. Megapede - A large centipede-like creature that lives in the Jungles. They appear in the film and video game, gaining a bigger role and more variety in the latter. Monstrutalpus - A greenish-blue lizard-like synapsid that lives in the Jungles. Morsel Fish - A fish species resembling the man-of-war fish. Mortifillex - A dragonfly larvae-resembling water insect that lives in the Swamps and Waterways. It didn't appear in the film. Needlemouth - A gar-like fish with sharp teeth that live in the Swamps and Waterways. It didn't appear in the film. Nefacossus - An armored worm-like creature that lives in the Swamps and Waterways. It didn't appear in the film. Nefundusaurus - A four-legged dinosaur with a bladed tail that lived in the Coastal Regions. It didn't appear in the film. Nepalacus - An aquatic myriapod with webbing along its flanks and reduced limbs. Noctupervagus - A flightless Terror Bird that lives in the Lowlands and Jungles. They lay their eggs on the ground near the roots of the trees. Noxmuscus - A wasp-like insect that feeds on snails. Omnimatercimex - A large arboreal centipede. It hunts the young of birds and dinosaurs. Once it had a kill, it would also spray it with an odor to prevent other predators from stealing it. Ornate Carrion Beetle - A fictional species of Carrion beetle. Osteodomus - A Hermit crab-like creature found on the island's coastlines. They use skeletons in place of shells. Papilio and Sepulcro - Heavy-bodied elongated fish that live in the Swamps and Waterways. Papilio has large fan-like fins and tends to be a yellowish-green coloration, while Sepulcro is bluish with brownish stripes. Peracerdon - A 12 to 16 ft. long bipedal dinosaur that lived in the Coastal Regions. It didn't appear in the film. Pinnatono - A flightless Terror Bird that lives in the Lowlands and Jungles. They are known to eat a highly-acidic berry. Pitchbug - A spider-like bug. Predatory Pond Skater - A species of pond skater that has made a living on the island. Prickle fish - A spiky fish species resembling a gar. Profanus - A tapeworm known to lay eggs in the wounds of their hosts. Pugbat - A flying cynodont resembling Terapusmordax. Pugiodorsus - A relic thyreophoran. Rhadamanthus - An anglerfish-like fish species. Rapanatrix - A knifefish-like fish species. Rogue Fish - A brightly-colored fish. Savage Gnat - A demonic-looking Dipteran. Scimitdon - An arboreal synapsid that lives in the Jungles. Scissor Beetle - A flightless scavenging beetle. Instead of flying, it hops like a grasshopper. Scissor-Head - A featherless, flightless pterosaur with stilt-like legs and a large head that live in the Swamps and Waterways. Scorpio-Pede - A centipede-like creature with two scraping legs near the head that lives in the Swamps and Waterways. They appear in the video-game, except as terrestrial predators. Scutucaris - A flat-bodied lobster. Its appearance allows it to hide in the narrowest of places. Segnix - A barb-like fish. Shagfish - A grenadier-like fish. Shaggywing - A type of moth. Sicklefin - A batfish-like fish. Skull Island Backswimmer - A fictional species of backswimmer bug. Skull Island Chameleons - A number of chameleons thrive on skull island, but differ from their African kin. Chamaeleo - A large predatory chameleon. Chamelephant - A chameleon with an elephant's trunk, hence its name. Fat Chameleon - A plump-looking species, hence its name. Honey-Tongue Chameleon - Another species, it gets its name by its diet of honey, tree sap and nectar. Trident Chameleon - An omnivorous, horned species. Skull Island Dung Beetle - A fictional species of dung beetle. Skull Island Egret - A species of egret endemic to the island. Skull Island Hawk - A species of hawk that has evolved to feed on the Aerosaurus. Skull Island Hornbill - A species of hornbill that feeds on centipedes. Skull Island Meat Weevil - A scavenging weevil. Skull Island Seagull - A fictional species of gull. Skull Island Snapper - A voracious aquatic tortoise resembling a Snapping turtle. Skull Island Termite - A fictional species of termite. Sparkleside - A milkfish-like fish that behave much like salmon, but are really in the mullet family. Stickalithus - A large spider with long legs that lives in the Jungles. Stink Fish - A hump-backed, bulky-bodied fish that lives in the Swamps and Waterways. Sun-fin - A fish that both looks and behaves like the African butterflyfish. Swamp-wing - A winged frog. Unlike actual Flying frogs, this frog has bat-like wings and can truly fly (though not very well). Tartarusaurus: A 20 to 26 ft. in length rauisuchian-like creature that lived in the Coastal Regions. Its hide is similar to the rhinoceros. Tiny Brightbird - A bird that resembles hummingbirds, but is really a Swift. Tree-Tops - A Ceratopsian with a streamlined body that lives in the Jungles. Turturcassis - A long-necked, four-flippered aquatic reptile that lives in the Swamps and Waterways. Its long neck helps in going into turtle shells and pulling out the meat. Udusaurus - A lizard-shaped reptile with rear flippers that lives in the Swamps and Waterways. They appear in the associated video game. Unguasilus - An unusual wasp-like insect where the fathers feed themselves to their own young. Virucinifis - A strange-looking dipteran insect. Vultursaurus - A literal flying dinosaur resembling the Yi qi discovered in 2015. It appears in the prequel novel King Kong: The Island of the Skull. White Wedgehead - A lizard found on the island's plains. They feed on dung beetles. Wicked Weaver - A large web-building spider. Zeropteryx - One of the Terror Birds that lurk in the Lowlands and Jungles. Zeropteryx is the second largest of the bunch. Death Jackal – Appearing in "Skull Island: The Birth of Kong," the Death Jackals resemble a cross between a Dromaeosaurus and a hyena. They are described to have the agility of a leopard and the bite of a great white shark. Mire Squid – A colossal red squid with eight arms that is eaten by King Kong. Mother Longlegs – A 5.5 to 7-meter-tall spider with long legs that resemble bamboo stalks. Psychovulture – A large gray bat-like creature with a snub-nosed skull that can shoot lightning from its mouth. Leafwing – A subspecies of the Psychovulture that have leaf-shaped wings and saw-like snouts for cutting prey to pieces. Sirenjaw – Appearing in "Skull Island: The Birth of Kong," the Sirenjaw is a massive crocodile-like creature covered in plant life. It is considered an ambush predator as it waits for its prey to get onto its back. Sker Buffalo – A giant water buffalo with large forked horns, algae covering most of its body, and a coral-shaped back. It has a DNA ancestry with the Asian water buffalo. One Sker Buffalo was being preyed upon by a Skullcrawler. Another Sker Buffalo was trapped under a wreckage outside the wall near the natives' village. Mason struggled to get it free and received unlikely help from King Kong. Afterwards, the Sker Buffalo took its leave. Skullcrawler – A subterranean reptilian creature with a skull-like head and no back legs. "Skull Island: The Birth of Kong" revealed that the Skullcrawlers were the reason why King Kong's race was nearly wiped out. As of The Birth of Kong, Skullcrawlers still live on the island, but do not reach the size of the alpha Skullcrawler that killed King Kong's family as he controls their numbers since killing the big one in the film. Spore Mantis – A large stick insect that is big enough to mimic a fallen log. All versions of King Kong present an island inhabited by giant animals, both invertebrate and vertebrate, but even though biophysical analysis of Kong and other creatures concludes that some are biophysically viable, the ecosystem of the island could not support them. The Universal Orlando Resort location Islands of Adventure features an attraction called "Skull Island: Reign of Kong" which is based on Peter Jackson's remake. ^ Matthew Moring (January 29, 2012). "Press Release: Doc Savage and King Kong Coming in March". Press Release. Altus Press. Archived from the original on February 18, 2013. Retrieved 2013-02-24. On the eightieth anniversary of these fictional giants, Altus Press is proud to release the first authorized clash between The Man of Bronze and the Eighth Wonder of the World – Doc Savage: Skull Island. Written by Will Murray in collaboration with Joe DeVito, creator of KONG: King of Skull Island, Doc Savage: Skull Island is a new pulp epic. ^ Mark Squirek (2013). "Doc Savage: Skull Island". Review. New York Journal of Books. Retrieved 2014-08-07. ^ Press Release (March 8, 2016). "Altus Press to Release King Kong Vs. Tarzan". Press Release. Altus Press. Retrieved 2017-01-30. King Kong Vs. Tarzan is scheduled for a Summer, 2016 release, timed to coincide with the promising and much-anticipated new Warner Bros. Legend of Tarzan film, and will be issued in trade paperback, eBook and hardcover editions. ^ "Kong: Skull Island – Kong-Sized - OWN THE DIGITAL MOVIE AND BLU-RAY™ NOW". Kong: Skull Island – Kong-Sized - OWN THE DIGITAL MOVIE AND BLU-RAY™ NOW. ^ a b c d e f g h i j k l m The World of Kong: A Natural History of Skull Island. Pocket Books. 2005. ISBN 978-1-4165-0519-8. Retrieved 16 June 2013. ^ Monge-Nájera, Julian. (2016). "Ann’s secret relationship with King Kong: a biological look at Skull Island and the true nature of the Beauty and Beast Myth". CoRis. 12 (1): 13–28 (ISSN: 1659-2387).